One of my favorite things to eat is apples, and I find that I enjoy them in one form or another pretty much every day. This includes the actual fruit, apple juice, applesauce, or even, apple pie! It’s one of my favorite fruits, and very versatile. Which is why I was very happy to try the products I was generously sent by Musselman’s, like their Totally Fruit Peach applesauce and the Lite Cinnamon applesauce. One 4oz cup is 0 grams of fat, 22 carbohydrates, 2 grams of fiber, 18 grams of sugar and 0 grams of protein. Apples, Apple Concentrate, Water, Peach Puree, Natural Color and natural Flavor, Ascorbic Acid (vitamin C) to maintain color. One 4 oz cup is 50 calories, 0 grams of fat, 13 carbohydrates, 2 grams of fiber, 8 grams of sugar, and 0 grams of protein. Apples, Water, Cinnamon, Ascorbic Acid to maintain color and Sucralose (a non-nutritive sweetner). Nature’s Path is definitely one of my favorite brands, especially when it comes to delicious cereals or granola bars. 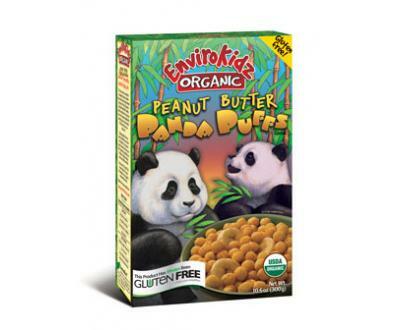 I haven’t met a product I haven’t liked, and to add to my list of favorites is Nature’s Path Envirokidz Organic Peanut Butter Panda Puffs. The people over at Nature’s Path generously sent me some products to try, including a box of the Envirokidz Organic Peanut Butter Panda Puffs. This cereal is gluten free, and made with corn meal. Each “puff” is a small little ball, and orange-yellow in color. They are very peanut-buttery, too! Absolutely delicious! I tried a few of them dry, and with milk. They were crunchy, and had a slightly sweet yet salty peanut butter taste. I like how they stayed crunchy for the most part with my milk, and if you let them sit a little bit, they really absorb some of the milk and it creates an almost different experience. One thing I did notice was that this cereal really “sticks” to your teeth! It reminded me of how when I eat a scoop of peanut butter or a peanut butter sandwich, how the peanut butter sticks to your mouth! However, it did not take away from the overall enjoyment of this cereal. 1 serving (3/4 cup) is 130 calories, 2.5 grams of fat, 24 carbohydrates, 2 grams of fiber, 7 grams of sugar and 2 grams of protein. Organic corn meal, organic evaporated cane juice, organic peanut butter, organic soy oil, sea salt, tocopherols (natural vitamin E). One of my favorite things to do is to bake yummy treats. Cookies, cakes, cupcakes, brownies, etc. I love to bake for others not only to make them happy, but it makes the house smell delicious! 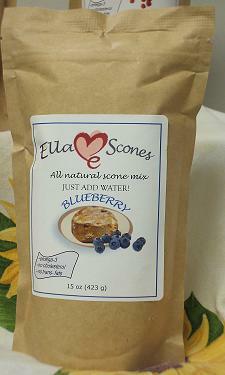 Which is why I was especially excited to recieve the all natural blueberry scone mix from Ella Baking Mixes. According to the package, “ELLA Scones are created in memory of our mother, who during the last few years of her life ailed from heart disease. The mixes are our tribute to ELLA, and it is her love for life that brings the heart healthiest scones to your table. ELLA scones are rich in Soy & Omega-3, which in studies have showed to be beneficial in the prevention of heart disease“. I ended up being able to make 12 muffins, which were average sized. Not super big, but not mini either. They smelled delicious while they were baking- a lovely blueberry aroma. Once they were done, I tried a piece. They had a mild blueberry flavor, were moist and fluffy, and lightly sweet. My friend tried some too, but she toasted hers and added a little bit of butter. She enjoyed them, and I ended up giving her some of the muffins to keep. Overall, these get 3 1/2 stars. I like that they are a good source of Omega-3, and that I had the option to make either scones or muffins. I do, however, wish they were a bit sweeter and had more of a blueberry flavor. If I were to make these again, I would probably add a bit of sweetener or spread some blueberry preserves/jelly on the muffin once it was done. I also wish they were made with whole wheat flour instead of wheat flour, or at least half whole wheat, half wheat for a higher fiber content. 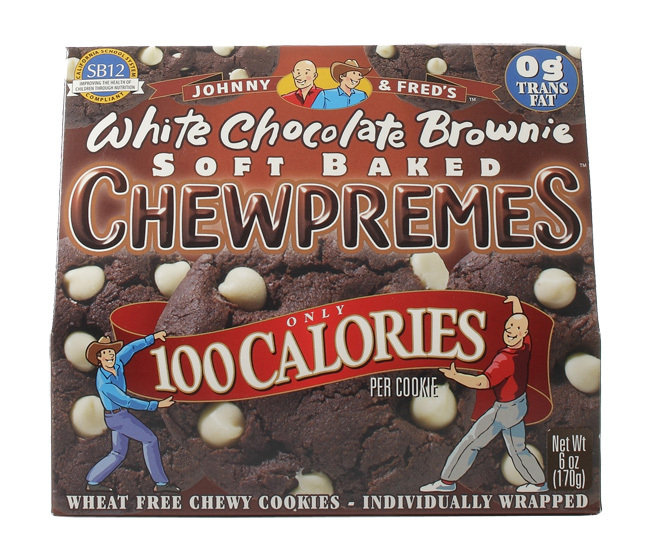 Ingredients in mix- Wheat Flour, Evaporated Cane Juice, Blueberries, Canola Oil, Soy Protein Isolate, Leavening (sodium acid pyrophosphate, sodium bicarbonate, corn starch, monocalcium phosphate), natural flavor, buttermilk, fish oil MEG-3. 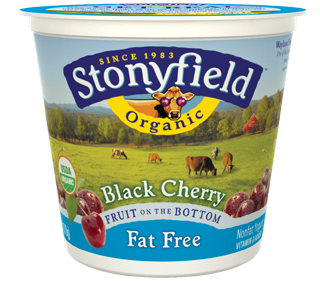 So, as a change from the standard blueberry and strawberry yogurts I usually have for the fruit on the bottom options, I decided to try the Stonyfield Farm Organic Fat Free Fruit on the Bottom Black Cherry yogurt. Cherries usually remind me of the summer- a fruit I usually nosh on at the beach, at my house, wherever! They are a great and delicious fruit. One 6 oz container is 120 calories, 0 grams of fat, 22 carbohydrates, less than 1 gram of fiber, 22 grams of sugar, and 6 grams of protein. Cultured Pastuerized Organic Nonfat Milk, Organic Cherries, Naturally Milled Organic Sugar, Pectin, Natural Flavor, Organic Elderberry Juice Concentrate (for color), Vitamin D3. The folks over at Yumnuts Naturals sent me the Chocolate Slow Dry Roasted Cashews to try, and I was so excited! I opened the bag up once I received them, and had a few. I can certainly agree with the “YUM” aspect of this product! 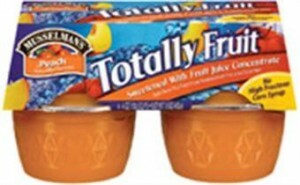 These were awesome! I especially liked that the cashews were pretty big- and there weren’t a lot of halves or pieces in the bag. Each buttery tasting cashew was covered with a sweet, light chocolatey coating, that gave a little bit of a crispy crunch to the outside. Really delicious, and what a snack! It satisfied both my hunger and my sweet tooth, and it certainly was hard to put away the bag after having some of these! These get 4 1/2 stars in my eyes. Absolutely delicious and just a great alternative when you want something both savory, satisfying AND sweet! The ONLY reason these don’t get 5 stars is because they have added sugar, but is still only 6 grams of sugar per serving. 1/4 cup is 160 calories, 11 grams of fat, 12 carbohydrates, 2 grams of fiber, 6 grams of sugar, and 4 grams of protein. 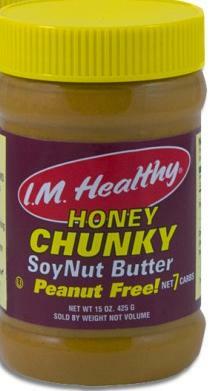 Dry-Roasted Cashews, Honey, Sugar, Cocoa Powder, Milk Powder, Soy Lecithin. 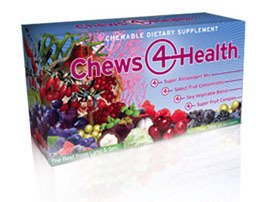 2 chew tabs is 10 calories, 2 grams of carbohydrates, and 2 grams of sugar. For information about the ingredients, you can click here.